Thanks for posting the vitals. Guru, is that black mass in the first picture the lungs or just blood? "Master your instrument, master the music, and then forget all that and just play." I hope to make good on some hogs at Rays place in a couple of weeks. This thread has been very helpful and I try to study up on something that I haven't hunted before. Thanks Terry and Curt for being so informative. 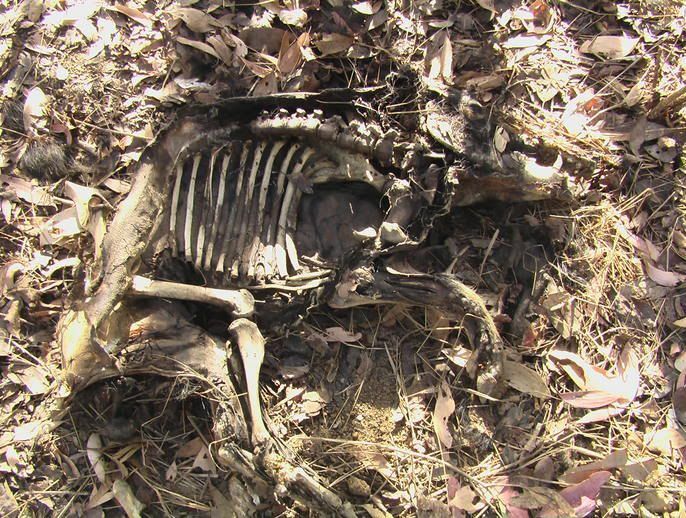 here s a pic of a boar skelton I found a few years back. and he s a pic of thickness of their fighting pad. Great info! I had no idea the plate was that tough! What does everyone think u the magnus stinger for hogs? I had a buddy just get back from texas on a hog/javi hunt. He shot 2 javi's and bent 2 stinger heads. 1 blade and 1 ferrule. Its got me a little worried now. I have a hog hunt scheduled for early may at shilo. Light travels faster than sound. Thats why some people appear intelligent, until you hear them speak. Terry, didn't you pass through another large shielded boar with a 4 blade? Would you please post pics? Yeah...O'l BlockHead....let me see what I can dig up. Nice work Terry. Appreciate the video tip as well. Someday this info will come in handy when I get to hunt hogs in the future. OK....I've added pics to my original post...AND to the 2nd post I made adding another hog for reference. All added photos are on the 1st page. Terry do you think a 3 blade like the vpa terminator coming of a 55 pound bow will pass through a heavily shielded boar? i'll be the first to say i'm no hog expert to say the least. 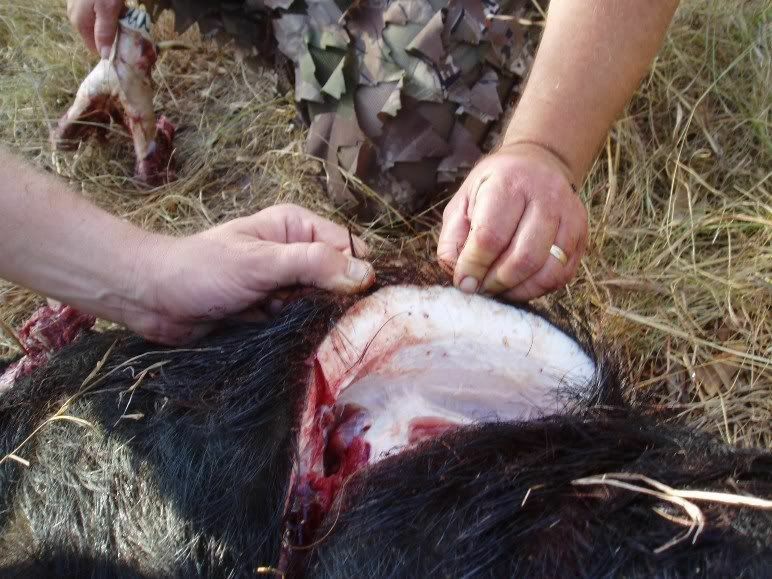 from what i have gathered on here and talking to guys that shoot a lot of hogs a pass through is very rare on large boars with thick shield's. i do think you would get enough penetration to make some sausage! I don't know for sure James....I haven't killed any big shielded hogs with a 55# bow. My kills on the two biggest shielded boars were with a 67# A&H ACS and a 70# MOAB marked those weights at 28"s and I draw about 27.5. Both of those boars were passed through with 4 blades though. I have passed through several nice size hogs with WW Originals and a 64# bow...but no large shielded ones. What is your arrow weight? What is your true draw length? What model of bow are you shooting? That is a very formidable projectile!!! Back to the Terminator... It is an awful lot like a 3:1 MA3 or Bodkin... and if Snuffers are truly gone, that is the first head I'm trying. I've always used for hunting, bows of 60# or more but everything matters, shot placement, angle, etc... the "Puna" as we call it here in Hawaii, is NO CAPE BUFFALO! Thick, gristled, and intimedating to be sure, but the energy of the arrow, the design, why I like the idea of the terminator, is what matters. 55# in MY OPINION would handle any basic pig... get into the truly huge pigs and I can personally tell you that I've not shot cuz onetime I was intimidated .... that was also with a 60# Browning takedown.